Materion has developed a manufacturing process for magnesium fluoride which produces a highly pure, dense material form that is particularly well suited for optical coating. MgF2, a low index coating material, has been used for many years in anti-reflection and multilayer coatings. It is insoluble and hard if deposited on hot substrates. Materion's MgF2 evaporates cleanly and completely, without outgassing or spitting, and leaves a hard, uniform coating on the substrate. Magnesium fluoride vacuum evaporation material is typically prepared from magnesium metal or other costly starting materials. Materion has developed a process whereby inexpensive, readily available raw materials are converted into absolutely dry, white MgF2 powder. The powder is then vacuum melted into clear-to-transparent ingots which are free of trapped water and other volatiles. The ingots are cleanly crushed to various particle sizes for vacuum coating. Materion's vacuum melted MgF2 typically shows these elements, each less than 100 ppm: Al, Cr, Cu, Fe, Mn, Sr and Ti. Please contact us if information on any impurity is critical to your coating application. Materion's vacuum melted MgF2 granules can be evaporated by electron beam or resistance heating. Graphite or tantalum containers are suggested. They are loaded to the top with material. For thermal evaporation, a large heater shaped like an open boat is used. The power should be increased slowly, and in the case of E-beam sources, the beam should be swept for even heating. Preconditioning for granules of MgF2 consists of fully melting the charge. The shutter should remain closed until the melt is uniformly red hot. No outgassing is experienced during the preconditioning cycle or during evaporation with Materion's MgF2 coating material. The pressure should be in the low 10-6 Torr range. When completely melted, the material can be evaporated at a smooth rate of 20Å/sec. without spitting. The temperature of the substrate should be at least 250°C for high film hardness and density on glass or zinc sulfide substrates. In difficult cases, a thin, initial bonding layer of yttrium oxide, Y2O3, can promote nucleation and adhesion. Films will grow and adhere to glass substrates heated to as low as 150°C. Glow discharge cleaning is recommended for low temperature depositions. The melt can be reused until reaction with the holder begins. The factor that limits MgF2 layer thickness to ~1 µm is internal stress. MgF2 can be doped with BaF2 to reduce this stress and permit thicker layers to be grown. Please contact Materion if this is of interest to you. Films of MgF2 that have been deposited on high temperature substrates (250-300°C) using E-beam deposition are mechanically hard but grow with densities only ~80% of bulk density. Voids in the microstructure admit water upon exposure to air, increasing the mean refractive index of the film. Absorption bands are seen in the UV spectra at 3 and 6 µm. Multilayers that include MgF2 will shift in wavelength upon venting the deposition system to room air. Films that are bombarded by high energy ions during growth achieve higher densities, since an amorphous structure is created. 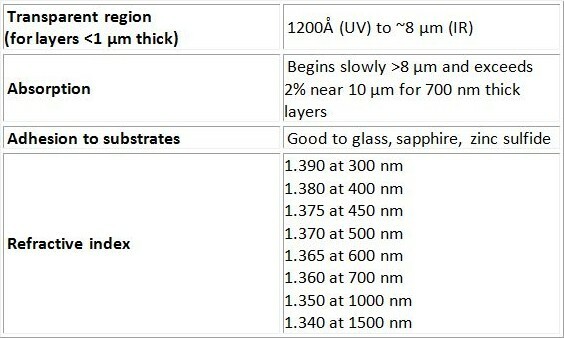 This produces an environmentally stable film with a higher refractive index. Excessively high ion energies can, however; deplete the fluorine content and produce absorption in the UV. View more information on Materion fluorides. We offer other particle sizes for evaporation as well as sputtering targets. To view items, please visit the Materion online catalog or CONTACT US. NOTE: Facts pertaining to properties and processing parameters of MgF2 were derived from published literature sources. Although this information is believed to be correct, Materion does not guarantee its accuracy. All printed, graphic and pictorial materials made available on this website are owned by Materion and protected by Federal Copyright laws. None of the materials, in whole or in part, may be reprinted and distributed or otherwise made available to others for any purpose without Materion’s prior written consent.